Spotify is planning to offer shares to the public within the next few months, so we wanted to better understand the reach of the streaming service and that of its competitors. Keep in mind that the data we have for Apple Music is purely from Android users as the app comes preinstalled on iOS devices which makes it difficult to track. Two new apps have been released from Spotify recently. Spotify for Artists, which debuted in October of last year, has 1.3M downloads and 882k MAU. Stations, which is only available for Android devices, has less than 5k downloads but it was just released late last month. 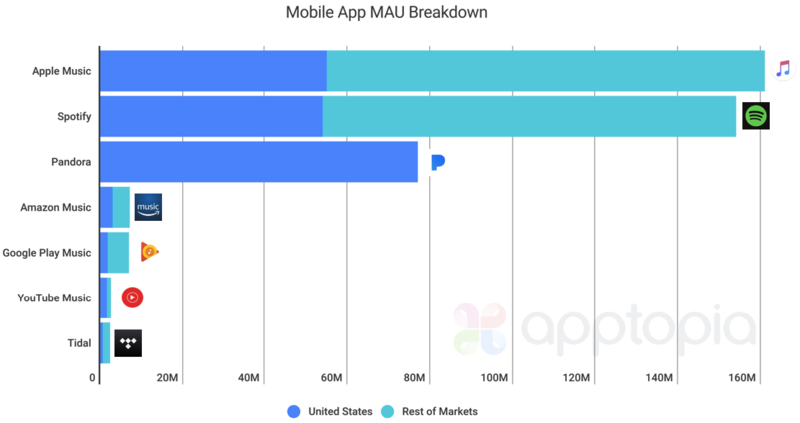 Considering Pandora’s market availability (one country), its usage is impressive when stacked against the other apps. Some people may look at this and be astonished that Pandora has more active users in the US than Spotify. You have to keep in mind that besides an app, people can also listen to Pandora and Spotify through their websites and web apps. Our data speaks purely for mobile apps. According to SimilarWeb, Spotify.com has 179% more unique views monthly than Pandora.com. In June, Spotify announced 140M MAU. As you can see in the above chart, we suspect this number has grown since then. How many markets does each app rank in? The above is different than market availability. For example, Tidal is actually available in 50+ markets. It doesn't get enough downloads and usage to rank in a good chunk of those countries though. Music apps have strong engagement by nature. People listen daily on their commutes, at work, when they excercie and more. On average, users of Spotify and Pandora open the app every 1.1 days. Tidal and YouTube Music are opened every 1.8 days. Amazon Music, every 2.25 days. Google Play Music and Apple Music are opened every 2.5 days on average. General speaking, apps draw a lot of downloads. It’s easy and free to download an app. Most people don’t end up using an app much a day or two after downloading it. Apptopia retention percentages represent the percentage of users still opening the app up 'x' days after downloading it. The above is a look at grossing rank from the past three months on the iOS App Store. Pandora almost never relents its #1 spot. 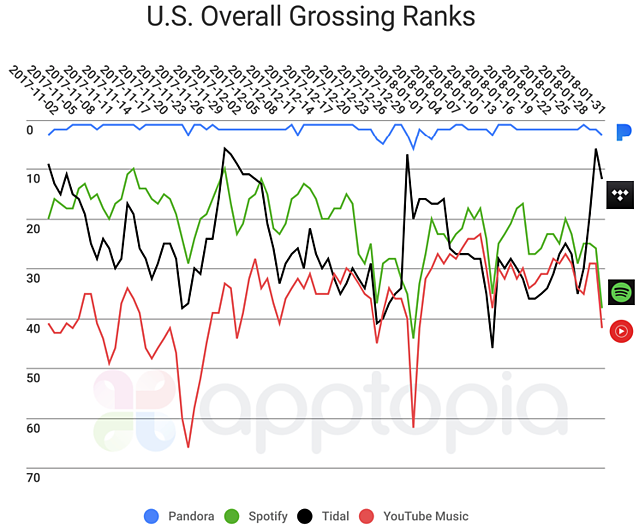 How can this be if Pandora has been struggling and Spotify has been surging? Most people choose to pay through Spotify's website as a subscription costs three dollars more through the app. The reason being is that Spotify does not want to pay the App Store fees. "In the end, there is little differentiation between the streaming music players," says Apptopia CEO Eliran Sapir. 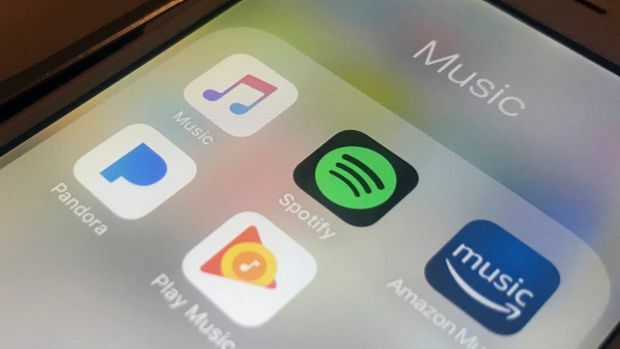 He believe Spotify and Apple have the best offerings because of their connectability to various devices but he gives Spotify the edge as it can work outside of Apple devices, and a text message does not interrupt the play of music. "It's really about the artists and music these services are able to provide that play a large role in their success." Tidal has tried to operate with temporary exlusivity with its artists and albums, but if there's a pattern of eventually ending up on Spotify, consumers will simply wait. As partnerships form and new competitive offerings arise, it will be fun to see which servies get added and pulled from various devices and platforms.